When you first import a multichannel Z series into ImageJ or FIJI is should be a hyperstack of multiple channels and multiple Z slices. This preserves original bit depth, dynamic range, and color LUTs. It may be displayed as the first Z slice in the first channel. 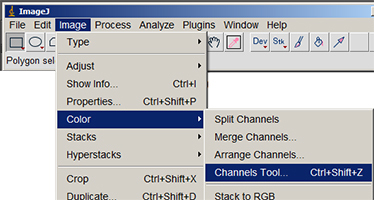 To display mutiple colors at once, use Image > Color > Channels Tools to select which channels you want to see. The check boxes turn displayed channels on and off. The contrast of each channel may be adjusted independently using the Image > Adjust > Brightness/Contrast tool. The active channel may be changed by moving the "C" slider and the color of the active channel is displayed as the text color at the top of the image. The pixel value at the cursor location diplayed in the status bar and measured intensity values are of the active channel exclusively. The color of any channel may be changed without altering the raw data by making the channel active and then using Image > Lookup Tables. The displayed channels (and colors and contrast ranges) may be programmed in a macro so that they do not have to be manually set for each image that is opened. Here is a sample macro that changes the colors of channels of a single Z slice file with a single click or keystroke and automatically montages the channels. If you want automation like this, please contact me. Raw data used in this webpage downloadable here. Color brightfield images are often collected by taking red, green, and blue individual images and saving them in series. This macro converts them to 8 bit RGB color.